My kids are out of school for the summer and I had lofty dreams about how much I could get done since I would not have to worry about drop-off and pick-up schedules and volunteer obligations. I somehow did not think about the fact that the kids would actually be at home WITH me as I was trying to cook, photograph, and write. It turns out that teenagers can be pretty demanding when they get hungry. 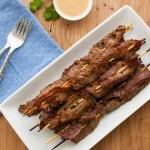 It was hard keeping my kids away from these beef satays as I was trying to style and photograph them. I can’t blame the kids though. The beef satays smelled divine as they were cooking. The marinade has all these great flavors going on – a little sweet, a little spicy, some salty. Do not be put off by the amount of chili-garlic sauce in the recipe. It adds just the right amount of heat. And aren’t the marinade ingredients, so pretty together? I know beef satay is usually served with a peanut sauce. I made a sauce to go with these but everyone really preferred the beef satay without it so I did not include a recipe for it. Honestly, the beef is so flavorful it hardly needs any accompaniment. Usually, whatever I cook and photograph during the day becomes dinner later that evening. However, these beef satays were too good to wait and we had them for lunch. I have a feeling that may be happening a lot this summer. Make the marinade by stirring the garlic, scallions, cilantro, cumin, brown sugar, fish sauce, oil, and chili-garlic sauce together in a small bowl. Set aside. Cut the flank steak in half lengthwise first (with the grain). Then, slice the flank steak across the grain into 1/4-inch-thick strips. Hold the knife at slight angle to the cutting surface to get wide strips. Weave the strips of beef onto bamboo skewers and place in a 13×9 inch pyrex baking dish. Pour the marinade over the meat. Turn the skewers in the marinade so that all the beef is evenly coated with the marinade. Refrigerate for 1 hour. Heat the broiler. Lay the skewers in a rimmed baking sheet in a single layer. Broil for 7 minutes, flipping the skewers over halfway through, until the meat is browned and lightly charred. You may have to cook the skewers in batches if you cannot fit all the skewers in the pan in a single layer. Cover cooked skewers with foil while you cook the remaining skewers. For easier slicing, freeze the flank steak for 30 minutes first. I did not have time to do this and found that just using a sharp chefs knife worked fine. Thanks. These were a real hit with the husband and kids and have become a regular part of our dinner rotation.